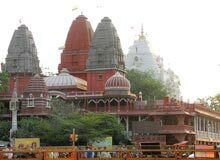 Sri Digambar Jain Lal Temple is the oldest Jain temple in Delhi, the capital city of India. Located opposite the colossal Red Fort, Jain Temple lies at the juncture of Netaji Subhas Marg and Chandni Chowk in Old Delhi. Initially built in 1526, much alteration and renovation have been made to the original structure. Erected in Red Sandstone, Digambar Jain Temple is commonly known as Lal Mandir. The temple is easily accessible by local buses, metro, auto-rickshaws and taxis from all over the city. Lal Mandir is primarily dedicated to Lord Mahavira, who was the 24th 'Tirthankara' of the Jain religion. The main shrine is sited at the first floor of this grand temple. It can be reached by taking a flight of steps, after crossing a small courtyard encircled by a row of pillars. Besides the main shrine of Lord Mahavira, the temple has numerous other shrines. One amongst the other shrines is dedicated to Lord Adinath, who was the first 'tirthankara' of the Jainism. Lord Parsavnath is also enshrined here. The religion of Jainism stresses on the 'Vaishnavism' (not in favor of slaughter of animals). Keeping the fact in mind, devotees bring fruits, grains, rice and other such things to make an offering to the Lord. The soothing ambiance of the shrine gets enhanced with the radiance of the butter lamps and candle lights. The walls of the shrine are also festooned with gilded paintwork. The divine aura of the temple brings a kind of spiritual vibes to the mind. Inside the temple complex, there is a bookstore with a wide collection of books. This assortment includes rare books of the Jain literature. Apart from the books, one can find exclusive curios and souvenirs that are associated with the Jainism. Paryushan, Samvatsari, Deepawali and Jnaan Panchami are the important festivals that attract devotees in large numbers to Digambar Jain Temple. Like other temples, visitors are required to take off their shoes before entering the temple.